My son's special project in Science this week is to create something out of recycled materials. Since I have plenty of old CDs here at home (coming from press kits and other promo materials) we thought of using them to update my boy's old night light. The old lamp looked something that would fit a nursery, LOL! He wanted something that looks sleek and cool. Rap and I took the CDs and grouped them in pairs. Each pair was then stuck to each other with super glue, shiny side up. The CDs were then assembled by sticking one pair on top of another with thick double sided tape. Holes were bored on 2 CDs which were then "sewn" on the metal stand of the old lamp using nylon string. Using a heated metal tube (I think it was from an old broom), the houseboy made the holes of 10 pairs of CDs bigger. This was needed to let the light fixture through. The rest were left as is. The houseboy attached the electric wire on the lighting fixture, fixed a switch in the middle of the wire, and finally assembled the plug. 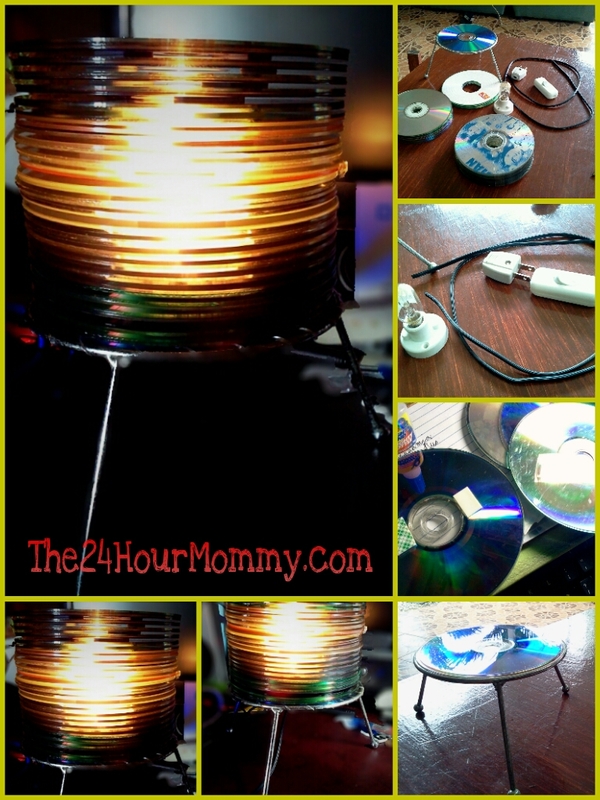 I know that our lamp's structure is a bit weak since we only used double sided tape to assemble the old CDs. Still, I'm assured that it's safe to use since it was the houseboy who took care of the electrical side of the project, hahaha! This is one of the perks of having a houseboy instead of a maid. I sometimes wonder if he knows how to tinker with complicated tools such as hygienic levers because he told me one time that he had a short stint at an electronics vocational school. We had fun doing this recycling project. I think we'll be doing this more often.